Nine subspecies (including the three in North America) of Merlin are found worldwide above 47 degrees north latitude. The Coastal Forest Merlin breeds in the Temperate Coastal Rain Forest, the Taiga Merlin in boreal forest and tundra (taiga), and the Prairie Merlin in prairies and parklands. Subspecies type specimens reside in the National (Smithsonian) Museum in Washington D.C. and the University of North Carolina. 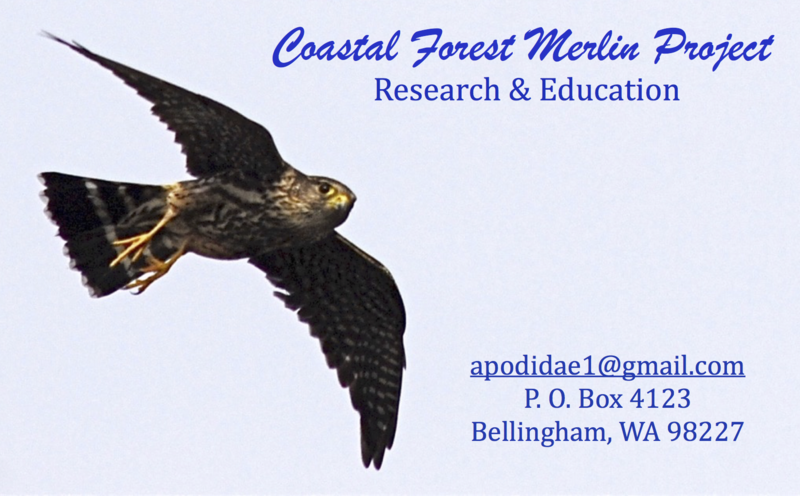 The Coastal Forest Merlin Project follows Dr. Stanley Temple’s 1970 master’s thesis study of North American Merlin ecozone designations. The Merlin was previously known in North America as the Pigeon Hawk because it looks and flies like a pigeon. The species name of the Merlin refers to the genus of the pigeon, Columba, transferred to columbarius, of the Merlin. Merlin derives from the old French Faucon ésmerillon and Spanish Esmerejón. Falco means hooked bill and curved or scythe-like talons (claws). Suckleyi refers to naturalist Dr. George Suckley, who with Dr. John G. Cooper and G. Gibbs accompanied the Northern Pacific Railroad Survey, commanded by Isaac I. Stevens, governor of Washington Territory. They explored roughly along the 47th parallel between St. Paul, MN and Puget Sound on the Pacific coast in 1853-1855. Suckley’s reports on the mammals, water birds, and fishes collected during the expedition appeared in the official publication issued by Isaac I. Stevens (Supplementary Report of Explorations for a Route for a Pacific Railroad (1859), volume 12 of Pacific Railroad Surveys.) Dr. Suckley collected the type specimen of the “Black” Merlin at Shoalwater Bay, Washington. A type specimen is the original on which all descriptions are based. This juvenile male specimen, a dark melanin-saturated individual, now resides in the National (Smithsonian) Museum.